This is one beautiful trek, which follows a beautiful trail along the Beas valley, into the mountains of the Dhauladar ranges. It takes you through lush green shephards meadows, and forests of Himalayan Birches and Junipers to a place from where the river Beas eventually originates. Beas kund is the name given to a small pond where Sage Beas used to meditate. This lake is considered sacred as it is believed that Sage Beas use to bathe here.The lake is fed by melts of snow from the mountains above. Dhundi is 18 kms from Manali. On the way is Solang . Solang is famous for its long slanty meadow, which makes it a ideal sking ground. Its also famous for paragliding as there is a flat grass patch for landing. 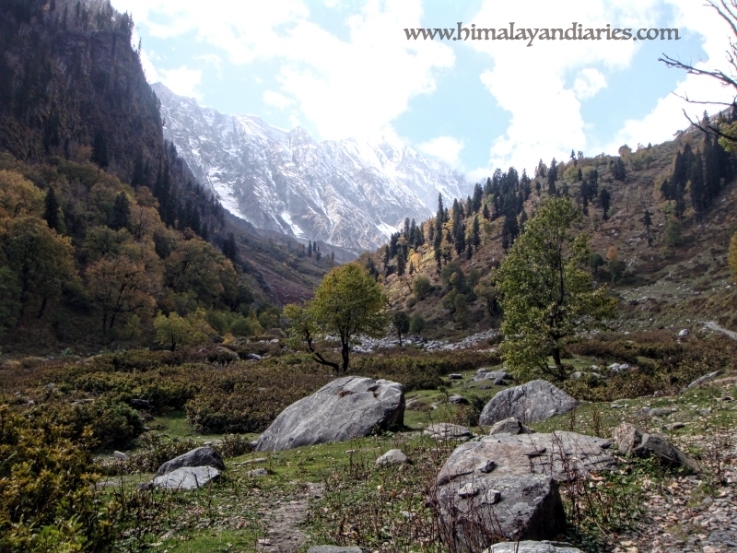 There is a road till Dhundi, but it’s a restricted to go beyond Solang. The route between Solang and Dhundi has to be trekked. Dhundi is a tranquil place , distant from the main tourist hustle bustle of the valley. The first night’s camp is here. The trek gradually starts taking ascend now. There are lots of lush green pastures on the way. Bakharthach is a small meadow on a small hillock. Bakherthach as the name suggest is a sheep’s grazing ground. From Bakherthach , one can view the seven sister peaks, Priyadarshani peak being the highest. This place is a base camp for most expeditions to the peaks above like the Mt Friendship and Mt. Shetidhar. The Mountaineering Institute at Manali also sets its camp here to impart Snow and Ice training. Camp for the evening here. Day 3. Bakharthach to Beas kund (3650 Mtrs) and back to bakharthach. Start the trek early morning . There is a gradual short climb and we reach a small moraine area.Then there is a long walk on a flat land. There are many small stream to be crossed. You can jump over them at places , or you walk over a bridge of stones. This place is paradise as you are surrounded by high mountains and snow covered peaks on thee sides. The flat land ends and you reach the Beas kund lake. This is a small lake fed by the melting waters of the snow mountains above. The river Beas originates here. As this lake is considered holy, it is mandatory to take your shoes off at a marked territory before the lake. Day 4. Trek back to Solang nala. Next morning enjoy the wonderful view of the mountains around Bakharthach. Then trek back to Solang valley.Reach Manali by evening.